Offering day charters for diving, line fishing and game fishing throughout the Northland region of New Zealand. 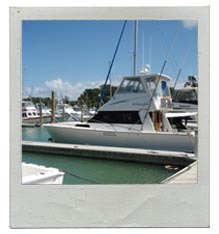 We have over 30 years of commercial fishing experience: 10 years being of diving and fishing in the local area. We offer all year round (weather permitting) departures from Whangarei, Marsden Point and Tutukaka, with destinations Northland wide including: Hen and Chicken Islands, Mokohinau Island and Great Barrier Island. Bookings are essential, so email or phone us with your enquiries and requirements and we’ll do our best to organise a great day out on the ocean for you.